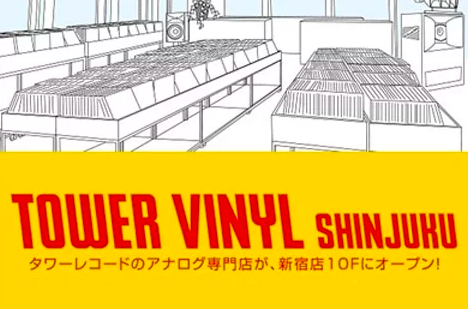 Tower Records is opening a new vinyl outlet on one floor of its flagship store in Tokyo. Tower Vinyl Shinjuku will boast over 70,000 vinyl records, including new releases and re-issues, along with limited editions. Bothe Japanese and Western artist recordings will be made available on the shelves. Around 40,000 vinyl items are secondhand, with a major bias towards soul and rock music. The launch will mark the first time Tower Records opens an analogue speciality store since the market shift from to digital CDs.